As cooler weather approaches, consider cozying up to a flickering flame. A pre-fabricated fireplace can be installed in any home with little hassle. Got fireplace envy? As Fall weather approaches it means the holidays are close behind. A hearth and mantel factor into so many traditions. And of course, in our part of the country “up north,” we appreciate and love anything that adds to the coziness of our homes. But what would it take to install a fireplace in an existing home? It may be easier than you think, thanks to a range of pre-fabricated options on the market. A traditional masonry fireplace is a built-in architectural feature, complete with a foundation and footings. But a factory-built fireplace looks like part of the home’s structure but is actually more like a built-in appliance. 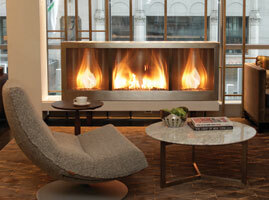 Many factory-built fireplaces “can be installed in an existing room with very little effort. It’s affordable and there’s no need for major remodeling,” says Sue Crosby, communications director of the Hearth, Patio & Barbeque Association, based in Arlington, Va.
Prefabricated fireplaces can burn wood as well as natural or propane gas. Also, some vent-free gas-burning models are available. Electric fireplaces simply plug into a regular wall outlet. The best option depends on the fireplace’s main function. “Down here in South Texas, it’s all about achieving that big roaring fire just for looks. Heat output is not as important,” says Donald Roberts, inside sales manager for Perfection Supply, a Houston-based homebuilding products supplier. This requirement does not necessarily disqualify wood-burning fireplace options, which generally “are a whole lot cleaner and efficient than they used to be,” says Roy Mjelde, owner of Top Hat fireplace and chimney specialists, with locations in Madison and Baraboo, Wis.
A “re-burn feature” prevents today’s wood-burning fireplaces from belching exhaust up the flue by supplying it with more oxygen “so what comes out of the chimney is clean and mostly water vapor” following that secondary combustion, Mjelde says. As a bonus, the re-burn process makes for “some interesting flame patterns and colors,” he adds. You should also check to see how adding a fireplace might affect your homeowner’s insurance coverage and rates. “When you’re doing a fireplace, it’s important to do it right,” says Mjelde, a member of the United Fireplace & Stove network of Hearth Stores. “If it’s installed wrong, then it’s obviously a fire hazard.” Click here for a full list of insurance needs to consider before your next remodel. For safety’s sake, both the network and HPBA recommend hiring professional installers certified by a reputable organization such as the National Fireplace Institute. So take advantage of the affordability and ease of installing a fireplace into your home. You’re sure to enjoy it for years to come! This article makes a great point about how the purpose of your fireplace is important. It gets cold where we live for at least half the year, so we are hoping to get a fireplace installed that can efficiently heat the living room. It is interesting that a re-burn fireplace limits the pollutants put into the air. If this can also heat the home efficiently, I will consider it an option. We want to put a gas fireplace into our house, so this is good to know. We’ve already decided on the fuel, but it’s great to know that this is an affordable process. We just need some extra warmth without blasting our furnace in the winter!